RK M-Sport World Rally Team’s Robert Kubica will take to this week’s Rally Italia Sardegna with one goal in mind – further progress behind the wheel of his Ford Fiesta RS WRC. Having conquered the challenge of Rally Argentina, the Pole will be keen to continue his development on the island of Sardinia. As one of the most technically demanding events of the year, Robert will need to apply all that he learnt in South America. Finishing in a creditable sixth place, the Pole produced a highly controlled performance, but as with any true racer, he will be keen to up his pace and continue his progress at the FIA World Rally Championship’s highest level. Sardinia may be a prime location for the world’s rich and famous, but it is also ideal rallying territory. The gravel stages are extremely fast but also demand an air of caution. Huge rocks and tree stumps line the route ready to turn even the slightest of mistakes into a costly error. The Formula One race winner has an affinity with all things Italian. Having made the move to Italy as a teenager, much of his early rallying was contested on the Italian asphalt and he claimed a dominant victory as part of the WRC 2 category on his Sardinian debut last year. Progress will be the name of the game for the Pole and his fellow countryman and co-driver Maciek Szczepaniak. The pairing made strides with their pacenote system in Argentina, and that is something that they will be keen to develop further as the WRC returns to Europe. “During my days in karting I spent quite a lot of time in Italy, so in Sardinia – as well as in Poland – I should have more fans than usual. Like all of the gravel events in the WRC, this is a difficult rally so in that respect my approach won’t be too different from the previous outing in Argentina. “Of course Sardinia is a rally that I got to know a bit in WRC2 last year, but my goal will stay the same. 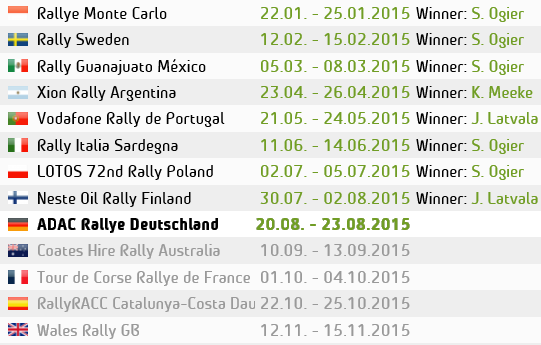 I will just try to maximise my chances of finishing the rally, which means minimising any mistakes.